When you think about symphony orchestral conductors, you probably don’t immediately think leadership consulting. But that’s exactly what Roger Nierenberg has become, due to his innovative work bringing insights from symphonic music to organizational change. I caught up with Roger on our From the Dorm Room to the Board Room podcast to discuss his work blending music and organizational behavior as well as advice he has for young professionals interested in launching their own entrepreneurial ventures. The following excerpt from that interview has been edited and condensed for clarity. Andy Molinsky: Before we get into your insights for young professionals, I’d love to hear a bit about how you teach leadership through orchestral music. Roger Nierenberg: Sure. 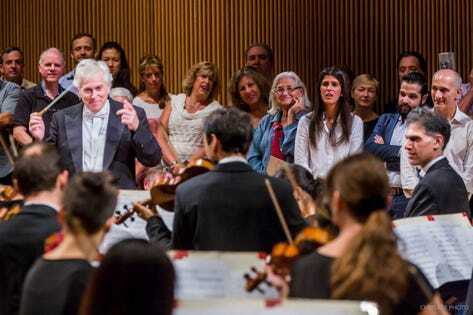 I appear with a live symphony orchestra and the room is set up in such a way that the participants in the organizational change program are all sprinkled throughout the orchestra, next to the musicians. So, they’re looking at the process from the players’ point of view. I then design role-playing exercises that cause the very issues that the business organization is struggling with to spring to life in the symphony orchestra. Molinsky: Sounds very creative. I’m curious what you’ve learned from this process that you can pass down to others. Nierenberg: I think persistence is enormously powerful, especially with creative endeavors. It’s very simple. You just keep on trying, even if something fails two or three times – because eventually there may be a little opening of possibility. And you have to recognize that opening, and find a way to seize the opportunity. Molinsky: What in your view makes for a good mentor? Nierenberg: Somebody who’s capable of seeing the potential in another person and who wants to help that person to grow. A mentor is also someone who will help that person expand his or her network because relationships are so important for growth and development. So, a good mentor will constantly be opening doors to new relationships and new people – which creates a a new diet of stimulation. Molinsky: What’s a piece of advice a mentor gave you earlier in your career that you didn‘t take, but you wish you did? Nierenberg: To be honest, I think it’s hard when you’re young to see things from a different perspective. And that certainly was the case for me. I got all kinds of advice that I simply wasn’t mature enough to receive. What I’ve learned is that when somebody gives you some advice — and it doesn’t strike you as correct, or relevant — really take some time to file the advice away. There may be something very important for you down the road that you can implement later.